Two of my favourite reads of the past year are now in paperback. If you haven't picked up 'Up for Renewal' or 'The Art of Racing in the Rain', now is your chance to get these purse-friendly paperbacks perfect for the beach, travel or just some night-time relaxation. The two books couldn't be more different. Cathy Alter's 'Up for Renewal' is a real-life account of what happens when you let a fondness for magazines take over your life -- literally! Cathy follows the advice found in popular zines and the fallout that ensues. Magazines are an addiction for me so I found her funny journey quite a joy to read. The great thing about Cathy's tale, you don't have to be mag-mad to enjoy her book. It's perfect for a late summer beach read. 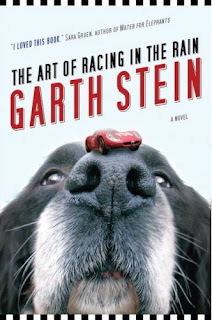 Garth Stein's 'The Art of Racing in the Rain' is a beaut of a fictional story. Told through the eyes of Enzo, the beloved family pet, it's both heartbreaking and inspirational. Be sure to have tissues near by when you read this gem. I'm always interested when my fave books get the paperback treatment. The covers often change -- in the case of 'Racing' here in Canada, the breed of dog on the cover changed completely - so to help you find both books, please find their new covers on display here. To check out their former hardback covers, click on the links attached to the books earlier in my post.